Hohenschwangau o el “Castillo del Gran Condado del Cisne” fue construido en las ruinas de la antigua fortaleza de Schwanstein por el rey Maximiliano II de Baviera en 1837, tras quedar profundamente impresionado por la belleza del entornio. Durante toda su vida fue el lugar oficial de veraneo y de práctica de caza de Maximiliano, su esposa María de Prusia y sus dos hijos Luis (Luis II de Baviera) y Otón (Otón I de Baviera). A su muerte en 1864 su hijo Luis II de Baviera le sucedio en el trono y heredó de su padre el mismo amor por este lugar, sobre todo después de 1869 cuando inició la construcción de su propio castillo, Neuschwanstein, a partir de una piedra que provenía de este mismo Hohenschwangau; pero esa es otra historia y se la contaré muy pronto. 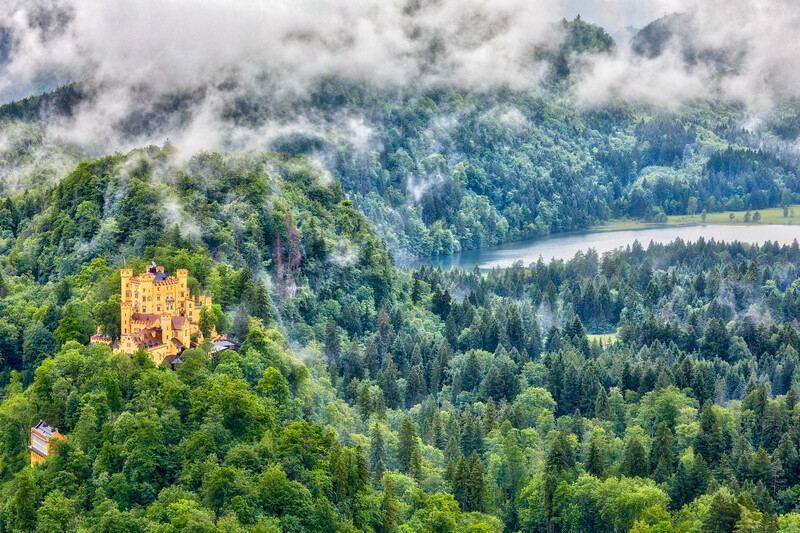 Hohenschwangau or the “Great Swan County Castle” was built in the ruins of the ancient fortress of Schwanstein by King Maximilian II of Bavaria in 1837, after being deeply impressed by the beauty of the surrounding. Throughout his life he was the official hunting and summer resort of Maximilian, his wife Maria of Prussia and his two sons Luis (Otto I of Bavaria) and Otto I of Bavaria. On his death in 1864 his son Luis II of Bavaria happened to him in the throne and inherited of its father the same love by this place, mainly after 1869 when it began the construction of its own castle, Neuschwanstein, from a stone that came from this same Hohenschwangau; but that is another story and I will tell you very soon.